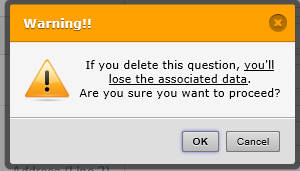 The text says: "If you delete this question you will loose all connected data. Are you sure you want to continue?" 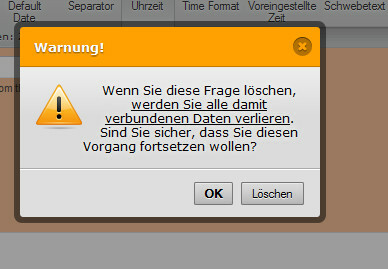 The word "Löschen" means "Delete"
When I press on "Löschen" (which means delete), the Question will NOT be deleted. We have now updated the word Abbrechen for Cancel so that it should display correctly. However, it takes some time to update in the database.